Analytics is one of the most important aspects of a blog and contributes a major role towards its success. For enhancing your SEO knowledge, keeping an eye on your analytics is a must. I recommend using any analytics software or service right from the first day. As a WordPress user, I prefer to use a plugin for that. This data includes visitor statistics, their movement on and off your website, time spent and their open source information such as location, browser, language, demographics etc. The reports are far more comprehensive than you can think as a beginner. Some analytics also include heat maps and flows. How To Get Yourself An Analytics Service ? In WordPress, You have two free options to choose from, Jetpack & Google Analytics. However, there is a major difference between both of them. The way they work is completely different, so is the way they execute the data. Jetpack is a WordPress plugin created by Automattic. This plugin comes with great features like related posts, sharing module, photon CDN, widget visibility, sitemap generation and many more along with the site stats integration. Jetpack comes with pre-configured site stats settings so you don’t have to do anything. However, a WordPress.com account is compulsory for using this feature and others as well. You can check statistics data collected for up-to a year with the jetpack. However, you cannot see the real-time data with it. It refreshes every 30 minutes. This is a pure beginner-friendly approach to analytics. More details on this are coming up right after we discuss a little about analytics from Google. 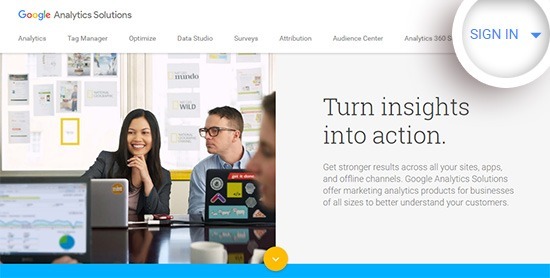 The google analytics is a complete solution for every data you will ever need. This isn’t a plugin for sure. Google analytics is a google hosted analytics software which is available to anyone having a Gmail account. For using this one, you need to install a plugin that seamlessly integrates with it. The tracking is done by inserting the dedicated code provide by Google to you. We often prefer to use GAFWD or MonsterInsights. With Google analytics, you can check out the time spent on your blog, the flow of your audience, the best landing pages, impressions and more. Q. How are they both so different? The statistics shown in the jetpack plugin isn’t 100% correct in most of the cases. The ratio is between 70-80% and that’s still significant to consider. The jetpack shows you some basic partial insights like what pages did your readers browse, where did they came from, how many searches were done, what outbound links were clicked, which author had the highest views, top searches and who referred to your site. A newbie would see jetpack’s data as a delight and that’s the truth. Jetpack is really great for beginners who just want to see how many views they have managed to get. But if you think from the perspective of marketing and insights, that’s way behind the woods in jetpack. 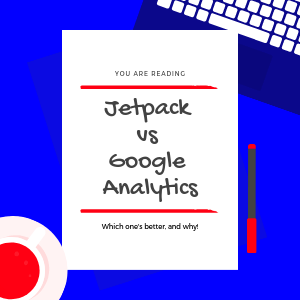 When compared to google analytics, the jetpack stands nowhere. The data Google processes and provides is very comprehensive. The google analytics shows you how exactly your visitors move on your website. Right from racking their inch by inch activity to evaluating their interests, google analytics does it all. And More. Everything you can imagine to reveal what your audience do is shown by google. The data it collects is extremely comprehensive and jetpack stands nowhere near so far. Jetpack also counts bot traffic coming from different IPs at a time. The same thing happens with blogger (Blogspot) stats too. Although it’s a rare event in jetpack still it happens. On the other hand, I have never seen google counting any not traffic. In any case. This makes sure that you only see the traffic that is genuine. As a beginner, jetpack is a great choice for you. But that doesn’t mean that you shouldn’t use google analytics. the dashboard of google analytics is surely a bit overwhelming and hard to understand for you but you can still collect the data, for future reference. This will give you the valuable data when you would need it. Meanwhile, you can look into jetpack for analyzing how many page views you got and where did they come from along with other data as well. Jetpack doesn’t show you bounce rate and time spent on your blog, something you should worry about. 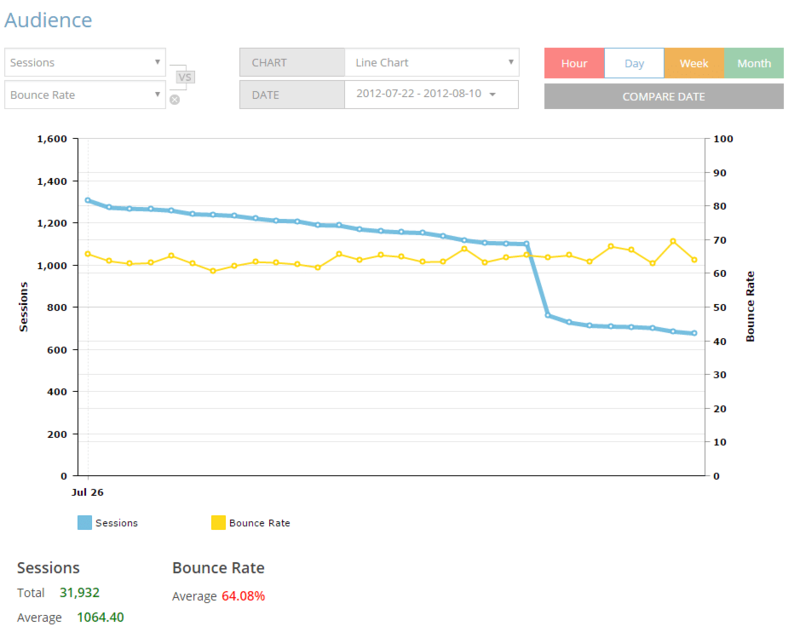 If you bounce rate is that means there is something wrong with your content or theme or somewhere else. But how will you know that with? With Google Analytics, not jetpack. So I suggest to scroll down this page and get your self a Google Analytics tracking code right away. The MonsterInsights plugin has a great custom dashboard where you can find all the traffic data without looking into your google analytics dashboard. There are both free and paid versions of monsterinsights and this plugin has an active installation over 1 million. Enable Sales tracking for your WooCommerce powered or Easy Digital Downloads stores. Ability to Collect data from any digital device accessing your content. See who’s clicking on your Google Adsense banner ads and how are the placements performing. Find out exactly how many times a file has been downloaded such as pdf(s) or cheatsheets. You can also Track authors, categories, searches, users, and more. See which posts are most popular among your audience and make it better than before. Find out exactly where a visitor is coming from like social media or some another blog. See your site’s performance at a glance right in your WordPress dashboard with their beginner friendly and clean custom page. Leverage site speed and sample rate for Google Analytics and enhance your SEO and performance. With Enhanced Link attribution see how people behave and move on your blog. You can get an add-on to enable accurate tracking of all mobile visitors to your AMP-enabled pages. Read how to disable amp without affecting SEO. Integrate easily the Google Analytics and Facebook Instant Articles and track them too. Easily enable Google Optimize on your blog. 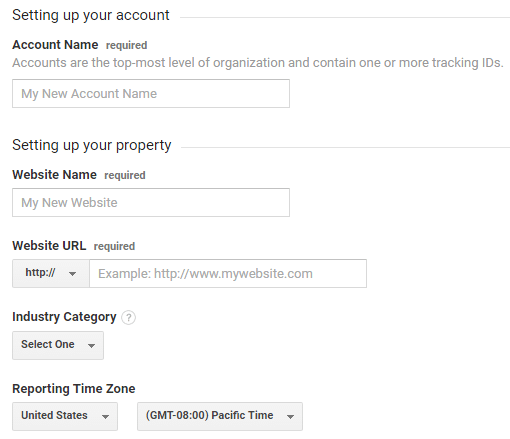 You can Enable tracking of your form views, submissions, and conversions rates daily. Although this plugin doesn’t have a custom clean dashboard as MonsterInsights does, the GADWP is completely free. And more. The GADWP is your complete solution if you can’t invest in MonsterInsights. 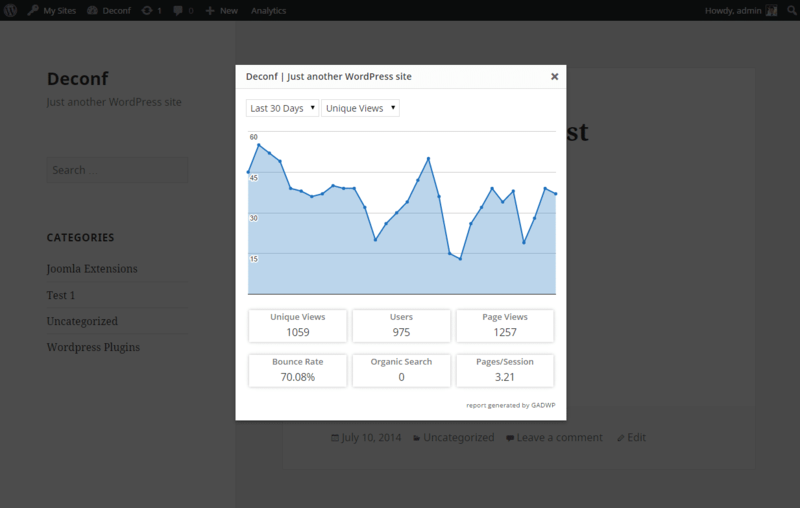 Finally, the Google Analytics for WordPress by web dorado is a powerful plugin with a comprehensive custom fascinating dashboard. The plugin comes with all the features as mentioned for others in this list, the Google Analytics WD is easy to use and fast. The inbuilt report is very intuitive and looks very pretty and informative with charts and graphs. 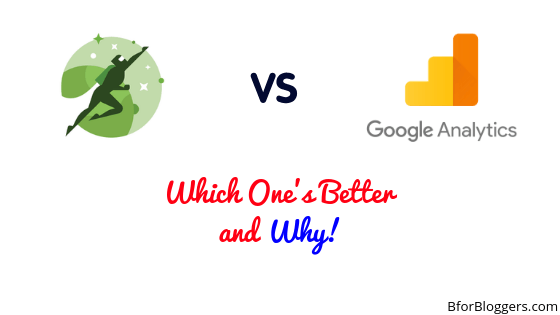 All In All the monsterinsights and Google Analytics WD stands as two great choices to make if you want an in-depth view at your traffic. Follow along this step by step guide to quickly setup your Analytics account on google Analytics to install and setup monsterInsights. At the end you will have your insights up and running. 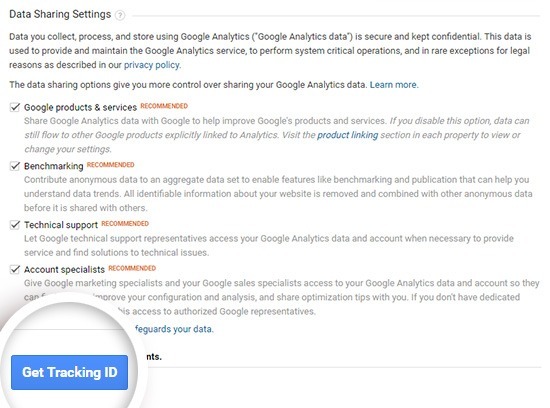 Head on to Google Analytics home page and click on the sign in link and click on the Analytics when shown in the drop down menu and after that Google will ask you to sign in with the account you want to use for associating with your Analytics dashboard access. After sign-in with your desired google account, you will need to sign up for Google Analytics account with your website. Click on sign up as shown in the picture below. After that google will ask you to select if you want to track a website or an App and since we are talking about a blog, we should choose the website. After that, you will need to to go to the bottom and enter your account Name. If you have a company name you would enter that here or else, your name. *Make sure you select the Https or HttpsS from the drop down menu on the left side of the URL section. If your website supports Httpss I. E. if your using the SSL secured connection to make sure you select that or else some plugins may take it as a different property. Enter all of your website details on the form and the primary URL you want to track, scroll down to the bottom and click on get tracking ID button. Accept the terms and conditions that appear and let the whole process complete. 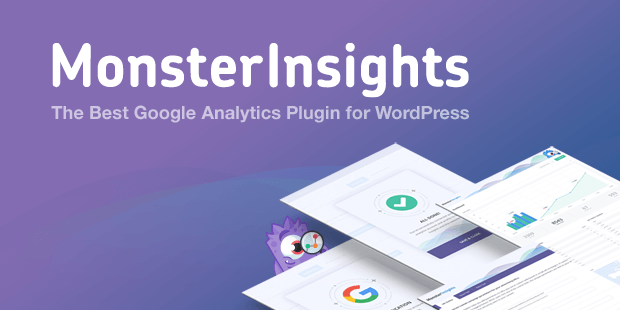 Once you have set up the GA, Go ahead and install the monsterInsights Plugin on your WordPress blog. Download and Install the MonsterInsights plugin. Refer to the step by step guide to install plugins for help. Once you are done installing MonsterInsights, go ahead and activate the plugin. 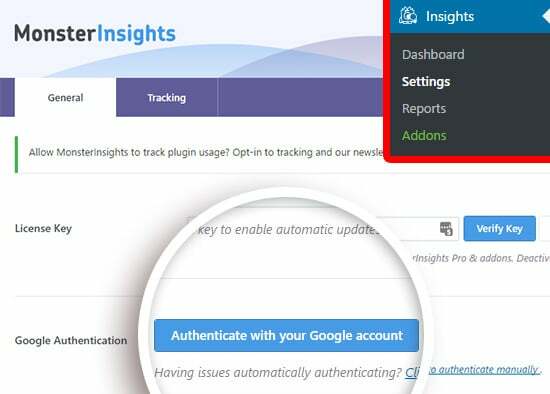 After you activate the plugin the first thing you will see is a notification for authenticating the plugin to connect with Google Analytics and your Google account. Click on the blue button saying “authenticate with your Google account ” as shown in the image above. You will be redirected to a page asking your preferred account to connect. Select the gmail account that is connect with your Analytics account. Click allow button to grant the access to monsterInsights so that is can collect the data from google and vice versa. Once you have allowed the plugin , the next screen will appear to ask you the profile you want to track with MonsterInsights. Click on the drop-down menu and select all website data or leave it as it is if it is already showing that. Now complete the reCAPTCHA And click on complete authentication button and you are done. The process remains the same for all other plugins. But at the end of plugins like GADWP you will have to copy the code and paste it. Except that everything remains the same. The data will take some time to aggregate. In a couple of hours, you will see the data being displayed on your Google Analytics dashboard. In case of jetpack, you don’t have to do any additional criteria for enabling the stats. Just install the plugin and activate it. Connect it with your WordPress.com account and you are good to go. So far, the Google analytics is the winner. That doesn’t mean jetpack isn’t worth it. I use both of them on my blog. Why? Well, jetpack gives me a quick overview of what is happening on my blog at every 30 minutes. This includes the top searches and top posts along with total views I got. Jetpack also shows me the referral traffic and the clicks I got on my outbound links. 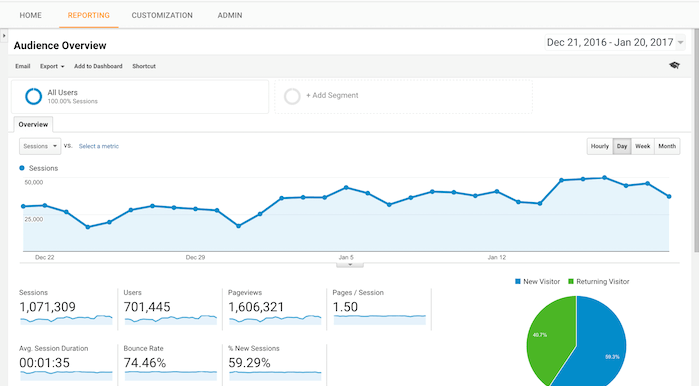 For investigating the bounce rate and time spent I look on the google analytics report. I compare both of them to see if they differ in sessions count and most of the times the difference is very low. Overall you should use Google analytics no matter how beginner you are. You can stop using jetpack stats and use its other features like email subscribing forms, related posts etc. Use the data to understand your audience. For example, you can find out the time you get most of the views at. After analyzing it for a week, try to publish your articles just a minute before this time. This will keep your audience engaged and eventually you will get more referral traffic. You can also look at the Google analytics report to check what are those posts which are performing the best. Promote these content and you will get valuable backlinks for it again, a good sign for SEO. You would also like to read about how to track email signups with Google analytics and how to find top landing pages from your Google analytics data. I hope this guide has helped you and if yes, share this post on your favourite social media and leave a comment below if you have any questions or problems arising. Great read Aayush. I personally prefer Google analytics and avoid using third-party tools but having alternatives is always a good idea. Jetpack is my go-to tool for sites which I want to hide from Google (PBNs :p), i.e., not link to my account. Great post Aayush. I still use jetpack with google analytics wd plugin. @Kome, Sure GADWP is a perfect free solution for Google Analytics tracking.